Explanation: When the Moon rose in predawn skies on February 23rd, it sported a sunlit crescent. It also offered early morning risers a tantalizing view of earthshine, the dark portion of the lunar disk illuminated by sunlight reflected from the Earth. Of course, on that morning a remarkable conjunction with three wandering planets added an impressive touch to the celestial scene. Recorded just before sunrise, this serene skyview looks east toward a glowing horizon across Tuggerah Lake on the Central Coast of New South Wales, Australia. 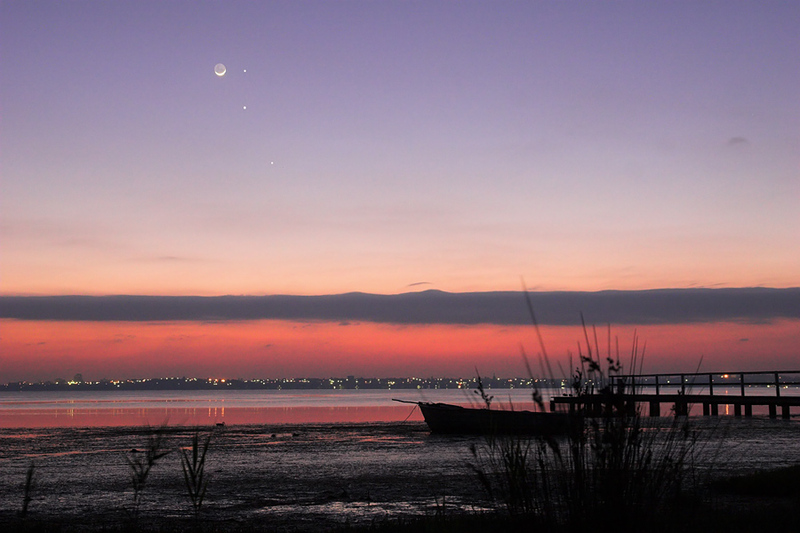 Along with the waning crescent Moon, the picture captures (top to bottom) bright Mercury, Jupiter, and Mars.